Kiwi rockers, Villainy have been redefining rock music in New Zealand 2011, after the broke into the scene with their hit single ‘Alligator Skin.’ After playing a smashing set to the Jim Beam Homegrown crowd, at sunset, this past weekend, Villainy have announced a New Zealand wide tour. The tour comes in celebration of the release of their third full-length album ‘Raised In The Dark’, which is due to be release on Friday, 12th July. Don’t miss out on the chance to see these rockers at the peak of their game. Earlybird tickets are already on sale. With general admission tickets going live on this Friday, 29th March. So get in quick so you don’t miss out!! 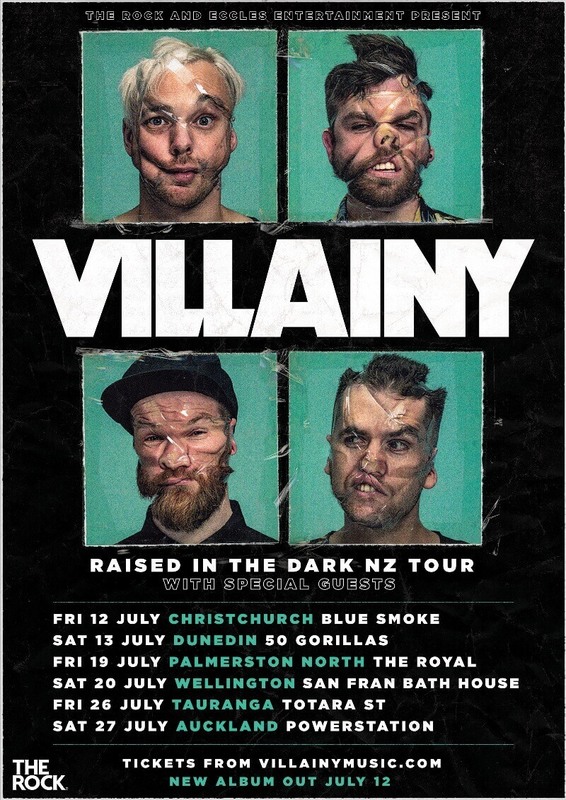 Hot on the heels of a triumphant performance to a capacity crowd at Homegrown, rockers Villainy have just announced a nationwide tour, which will coincide with release of their highly-anticipated third album, ‘Raised In The Dark’. Today’s announcement follows the release of Villainy’s new single ‘Dreams‘ – an uplifting slacker anthem, wrapped around the generational catch-cry “No-one gives a f*** about your dreams” the track is a bluntly direct anthem to inspire and provoke. A shift into new territory, ‘Dreams‘ gives fans a taste of what’s to come on the band’s third full-lenght album, ‘Raised In The Dark‘ – released on July 12. “We went all in on this record and over 12 months wrote literally 107 songs before picking the ones that made the grade. Beneath all the smashing, screaming and noise there is a real honesty and vulnerability to this album which we’re really proud of.” says frontman Neill Fraser. “We were really humbled that so many people the songs word for word, it was a privilege playing to such an engaged and connected crowd.” says Fraser. Their first two albums – ‘Mode.Set.Clear’ and ‘Dead Sight’ – debuted at #1 and won NZ Music Awards for Best Rock Album. Villainy have also appeared at countless festivals as well as being hand-picked to open for AC/DC during their New Zealand stadium tour, most recently toured with iconic Kiwi rock stars, Shihad, and opened for the legendary Incubus on their New Zealand tour. Now, with ‘Raised In The Dark’ promising to be Villainy’s most ambitious and adventurous release yet, this is your chance to see one of New Zealand’s best rock bands live at the peak of their powers! Villainy want to look after fans by giving the change to get a specially priced early bird ticket. Earlybird ticket are on sale now until allocated is exhausted. Tour presented by The Rock and Eccles Entertainment.